A painter in the Neo-Expressionist style, Russ Warren draws inspiration from Spanish masters such as Velázquez, Goya and Picasso, as well as from Mexican folk art and the American Southwest. His 45-year career is examined in the exhibition Russ Warren: Works 1971-2015, on view at the Sarah Moody Gallery of Art at The University of Alabama from October 29-December 4, 2015. Image credit: (top) Russ Warren, “Night Fishing at Moms,” 2014, acrylic on canvas, triptych: 60 x 48 inches each panel; 60 x 144 inches total. Image courtesy of Les Yeux du Monde, Charlottesville. 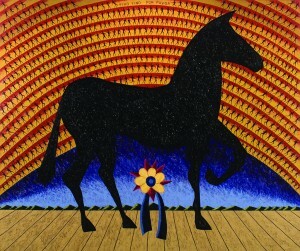 Image credit: (middle) Russ Warren, “Fino Fino Por Favor,” 1991, Acrylic on canvas, 60 x 72 ½ inches, Image courtesy of Les Yeux du Monde, Charlottesville. 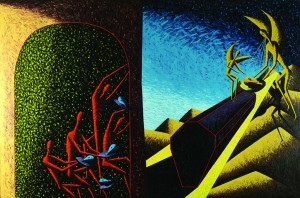 Image credit: (bottom) Russ Warren, “Burial at Barrio San Antonio,” 1986 , Acrylic on canvas, 60 x 90 inches, Image courtesy of Les Yeux du Monde, Charlottesville.